In the previous post, we have seen difference between final, finally and finalize. In this post, we will see what is exception propagation? Exception can occur at any step in the program and there should be proper exception handling. Exception is thrown from the top of the stack, if it is not caught then it will drop down in the call stack and look in previous method if exception is caught there or not. If exception is not caught there also , then it will drop down to previous method and like wise it goes on .. unless the exception is caught. Suppose we have 4 methods m1,m2,m3 and m4. If exception occurs in m4 but exception is not handled there. It will drop down to m3 to check if exception is handled there. 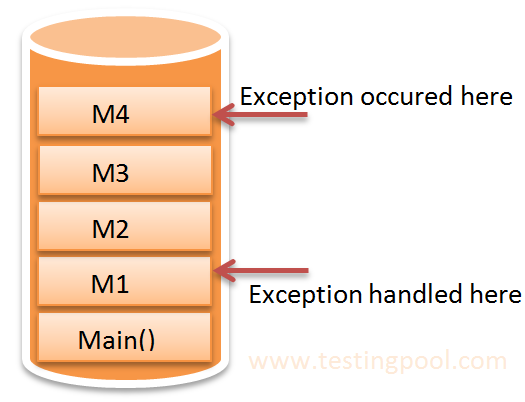 Consider exception is handled in m1, then it will come till m1 and handle the exception. For unchecked exceptions , exceptions are propagated. Let’s understand with an example. Exception are not propagated for checked exception like IOException,SQLException etc. Let’s see with the example.